At the commemoration of the 49th anniversary of the overthrow of the first president of Ghana, Dr Kwame Nkrumah, which was marked with a protest in Accra yesterday, the Convention People’s Party (CPP) launched a scathing attack on the National Democratic Congress (NDC), accusing it of trying to destabilize the CPP. According to the CPP, the protest by the youth league of the party at the Obra Spot in Accra was to demand the release of the party’s assets across the country, which were confiscated after the overthrow of Dr Nkrumah in a coup d’etat led by Col. E.K. Kotoka on February 24, 1966; and also to seek justice for Ghanaians in the economic, social and political spheres. The assets include the current Ministry of Information building, the Ashanti Regional education office, the Eastern Region municipal education office and the premises of the Sunyani Regional Police Command, among others. 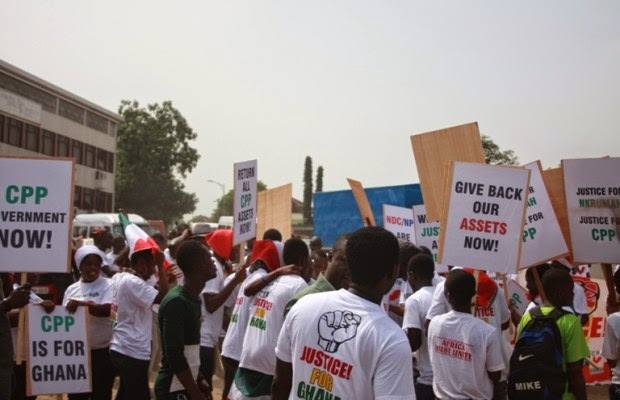 Ernesto Yeboah, Deputy National Youth Organizer for CPP, disclosed that the protest was part of a multi-disciplinary approach the party had planned to ensure that justice was handed to it. “All these assets have been confiscated and then we are asked to compete freely and fairly with other political parties in an election. This is certainly not democracy but hypocrisy. We are leaving no stone unturned. As we speak, negotiations have gone on with almost every government that we have had in the 4th Republic. Our legal affairs committee is already in court and also the youth of the party present here are engaging in this massive protest all to send the message down home to the people of Ghana that injustice is being done against all of us,” he stated. Meanwhile, the Accra Central District Commander for the Ghana Police Service, Chief Superintendent Aboagye Sarpong, who was present with a host of police personnel, commended the CPP for following the instructions handed over to them by the police.